Maggie's Notebook: Pamela Wiggins Bigamy Arrest: Pamela Long Wiggins Food Stamp Fraud? 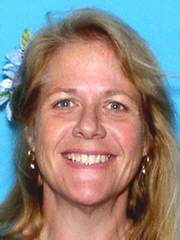 Pamela Wiggins, also known as Pamela Long Wiggins, was arrested today on charges of bigamy in Escambia County, FL. and she is under investigation for food stamp fraud and the EPA is looking into allegations that she illegally cleared and developed wetlands in Santa Rosa County. That should get her in big trouble. See update 8-18-09 10-25-09 below. Long Wiggins, 47, shot to national attention when the safe belonging to Byrd and Melanie Billings, the couple murdered on July 9th in Beulah, FL with 9 adopted children in the house, was found buried under a pile of bricks in her own backyard. At that time, we saw photos of private investigators escorting her off of her yacht in handcuffs. The yacht, Classy Lady, was harbored at The Wharf in Orange Beach, AL. Pamela Long married Jimmy Malden, Jr. in Alabama on May 5, 2007. Malden said he has been trying to divorce her for months. 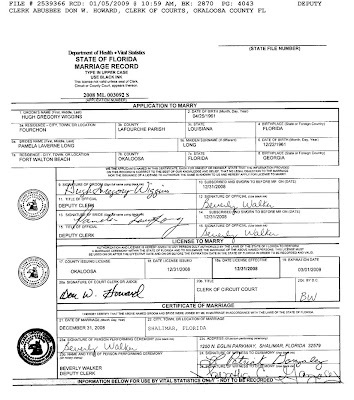 Long Wiggins married Hugh Gregory Wiggins in December 2008 and the "mastermind" of the Billings' murders, Leonard Patrick Gonzalez, Jr. and his wife Tabatha signed the marriage certificate as a witnesses. Pamela Wiggins is out on bond of $10,000 on charges of "accessory after the fact" in the murders of the wealthy Billings who adopted 13 children, 9 of whom were in the house the night of the murders. The low bond on "accessory" charge has been questioned. Her bond is $5,ooo on charges of bigamy. She is still jailed at this time. Long Wiggins is believed to be a real estate agent owning numerous real estate holding, including homes, a strip center and a yacht. Long Wiggins owned the Magnolia Antique Mall in Gulf Breeze, more than a dozen homes on the verge of foreclosure and a yacht called the Classy Lady. Authorities claim they have documents, including Long Wiggins' application for food stamps. It is not clear whether she actually received food stamps. Pamela Long Wiggins is also known as Pamela Lavern Long Coco. Another arrest has been with possible links to the Billings' murders. Henry Cab Tice owned Byrd Billings $10,000 and Billings had filed a complaint against Tice in May 2008 for grand theft. See See Henry Cab Tice is Byrd Billings Arrested Debtor: Tice Billings Mexican Mafia? Pamela Long Malden Wiggins has been out on bond after this latest arrest for bigamy and food stamp fraud. Today her bond was raised from $10,000 to $50,000 after unnamed sources said she might be a flight risk. She is back in jail. Read the latest about Patrick Poff Gonzalez straight from a jail interview with a Chief Deputy and an Investigator: Patrick Poff Gonzalez Whack Bud Billings? Gonzalez Implicates MS-13. Hugh Wiggins is Pamela Long Wiggins Husband: Hugh Wiggins is Patrick Poff Gonzalez Friend? Pamela Long Wiggins is Arrested; Billings Safe Found?